Pb Elemental is a local company comprised of architects, structural engineers and in-house sales, who’s attempting to redefine Seattle architecture one parcel at a time. 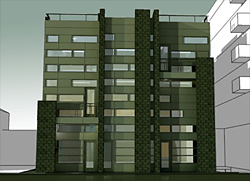 Their portfolio is comprehensive and includes single family residences, townhomes, mid-rise apartments, live/work lofts, commercial structures and a pencil thin highrise. There is consistency in their design style; the first thought that comes to my mind is “90° blocky” (mind you, I’m no architectural connoisseur). It seems their design trademark is rectangular cubes. Since this is a condo and lofts blog I wanted to highlight a few of their projects that readers and potential homeowners/investors might find intriguing. 151 Lofts, located at 12th Avenue and E. Fir Street, is a 6-story complex consisting of 18 2-level one-bedroom loft homes roughly 770 sq ft in size. Home elements include garage door openings, operable sun shades and individual exterior cantilevered staircases leading to private roof top decks for top level units. 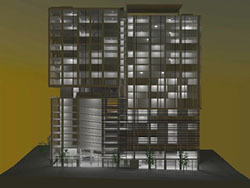 Other features include a common courtyard, garage parking, zinc exterior materials and street level commercial space. Pb anticipates the units will be offered from the high $400,000 to low $500,000s. The unit layout will be similar to South Park Lofts. Pb has already razed the existing building and expects to begin construction in a few months. Pb is the architect and developer of this project. 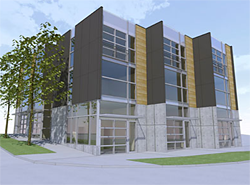 Located in Ballard, the 56th Avenue Live/Work Lofts, will feature six 3-level commercial zoned live/work loft units in two structures connected via a central walkway. Pb is the architect for this project. 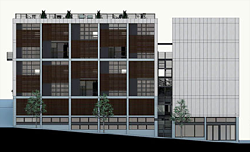 Similar in scope to the 56th Avenue project above, 36th Avenue Live/Work Lofts will include six 3-level commercial zoned live/work loft units in the Fremont neighborhood. Pb is the architect for this project. The ID Building is a 24-story hotel/condo concept proposed for 4th Avenue between downtown and the International District, across from the city’s Emergency Operations Center. Pb informs that they are still in the early stages and development of this project is dependent on zoning changes for the area. Should they get the green light, the ID Building will include a boutique hotel on the lower 12 floors and condos on the upper 12 floors with an open air roof top area that’ll include hotel and residential amenities. Pb is the developer and architect for this project and is aiming for a 2011 start date. Looks like PB is going to learn the hard way about live-work spaces (selling of). I’m curious if they really have the financing to pull off the hotel-condo deal. Those are about as impossible to finance as anything (read hotel1). Supposedly they were to build a highrise 24 unit tower next to the alchy house in the Denny Triangle. I think Pb will be fine, they actually design Live/Works where you can Live and Work. Most of what has been designed by others lacked in both aspects. I am excited to see the hotel be developed in the Japantown, it has been along time coming.